Join Priestesses Brandi Auset and Kimberly Moore for a year of Dark Moon Magick 2019! 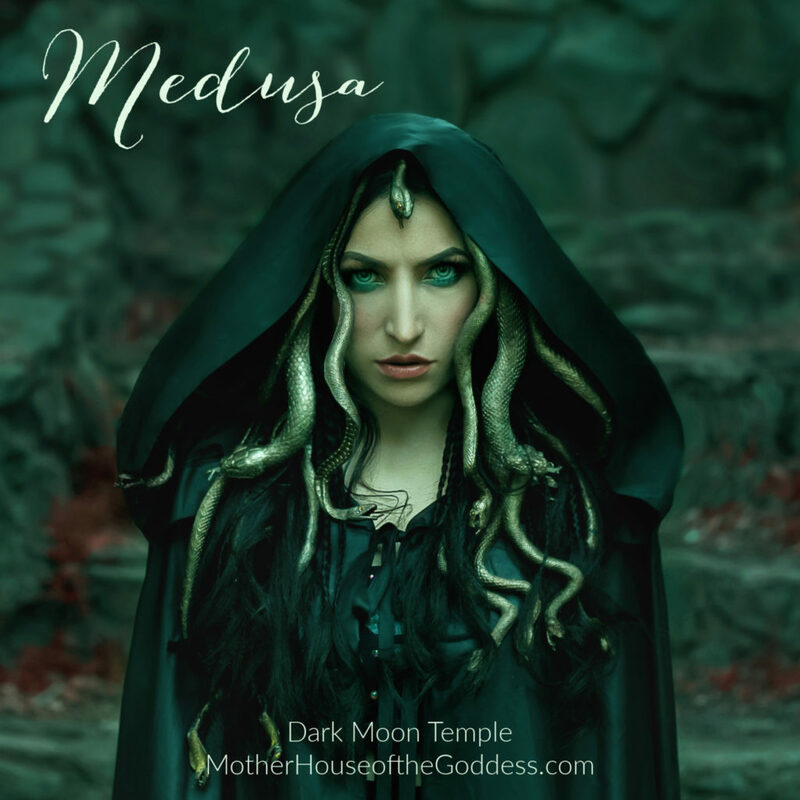 Our next Goddess is MEDUSA and we will be gathering on 3/4/19. Medusa encompasses a very interesting duality that is not often discussed. She is most famous as one of the three Greek Gorgon sisters. The Gorgon’s face is one of the oldest figures in Greek art and in many cases looks like a death mask with wide eyes, protruding tongue, tusks, and wild matted hair or live serpents surrounding Her head. Gorgons are winged creatures although they were born of parents who were monstrous creatures of the ocean. Interestingly, as we step away from the Greek interpretation of Medusa, a more ancient story unfolds. Medusa was a Priestess and Queen of Libya, an African Queen “married” to the God of Oceans, Poseidon. She was renowned for Her beauty and warrior skills. She led armies and also embodied the wisdom of the Great Goddess. Medusa has been called “Mother of Mountains” and linked to the Great Warrior Goddess Atargatis. It is possible that She did battle Perseus and that battle culminated in Her death. Greek myth also tells us that Medusa was the only Gorgon that was mortal, indicating that She was possibly a real person before becoming known as a Gorgon. Medusa is fearsome. She represents power, wisdom, and truth that can overwhelm all of our senses to the point of paralysis. In the face of the Gorgon’s visage, we are confronted by our own fear of powerlessness and nightmare scenarios. But, as happens when we gather our courage and face our fears head on, they are diminished and the truth and wisdom at the source of those fears is revealed. This is also Medusa. By “looking at Her”, we are looking at our deepest fears, those things that have turned us to “stone”, but on the other side of those fears, we see a shining winged Goddess with golden hands and the ability to show us our own power.